In Asia, “face” is everything. Standards of conduct and ritual are strictly defined, as they are in the diplomatic world. Image is managed to a precise degree. Yesterday, Michelle Obama’s office announced that she would not be attending the Presidential Summit in Rancho Mirage this weekend in order to spend time with her children as the school year closes. This is a very bad mistake for our country’s face. 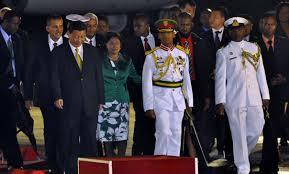 Xi Jinping is the recently installed General Secretary of the CCP and President of China. 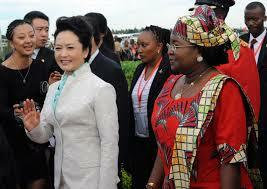 His wife, Peng Liyuan, is a superstar singer in China with what has become a massive global impact. Her stardom was earned, and she is herself a major celebrity. They have been on their first trip to the Western Hemisphere visiting Mexico, Costa Rica, Trinidad, and now the United States. There are serious issues under discussion; North Korea, the trade imbalance, the fate of nations.And there is serious kabuki necessary to the greasing of the political and cultural wheels. Face time is a big part of this. Xi is under pressure from China’s military to support an expansionist agenda aimed at securing the nations raw materials and to a large order, the respect of the world, especially the United States. China is our country’s largest business partner and our debtor as well as the largest country by population in the world. Their culture is over 3,000 years old and highly defined even now. And Michelle Obama has just caused Mr. and Mrs. Peng to lose face. By not attending the summit she has denied Ms. Peng an opportunity to shine on the global stage with one of her most important counterparts. She has denied her the dinners and shopping and photo ops and the bonding that comes with these meetings. Especially in Asia, the medium is the message. And the message that can be crafted in the media not only in China but throughout Asia is that Mrs. Obama either doesn’t care or has deliberately offended Mrs. Peng. 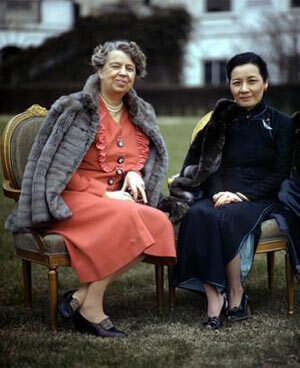 During World War II Eleanor Roosevelt met times with Madame Chiang at the White House and at Hyde Park to show the friendship between China and America. Since then, the first ladies of China have been in the background with the exception of Jiang Qing, of Gang of Four fame, and now Madame Peng. Having spent much of my time in Asia and with my somewhat inadequate understanding of the culture and politics thereof, even I know how Americans can be completely insensitive to deeply held customs and protocols. With a massive State Department protocol section and her own Protocol Officer, Mrs. Obama must surely have known the importance of simply showing up and being nice. Smile for the cameras and go home. This is a message almost all of our First Ladies have understood and most wives and many husbands do as well. make an appearance and make nice to help your spouse do their job, whether it is with the boss and his wife or ones colleagues at work or at a school function. It is common courtesy. You can bet this will be reported not only in China but throughout Asia. While the Chinese President is winning friends and influencing people our President and his wife have committed a very serious faux pas. And at a time when we are so dependent upon cooperation with China and other countries as our president has chosen that the United States is just one among many countries, we are especially dependent upon the good will and friendship of countries like China. Lost in the news about the election yesterday was an article in the Daily Telegraph on the uproar surrounding the Liverpool Care Pathway, or as it is known to some, Crematorium Lane. Over 1,300 doctors, nurses, and caregivers wrote to defend the policy, which is used in almost all UK hospitals today. Since the inception of the concept in the 1990’s, doctors have been struggling with end of life care. The LCP is a multidisciplinary process of assessing and treating seriously ill patients with little hope of recovery. Solutions include cessation of treatment, withholding of food and water, and even of IV drips. It is not an evil process in itself, but rather in its application. death comes to us all and death with dignity is a right. But it has been revealed that many hospitals stand to reap performance bonuses for “Commissioning for Quality and Innovation” (CQUIN), or setting targets for the number of patients who are treated using this regimen. In 6% of all cases, the families were never informed that their loved one had been placed on the Liverpool Pathway, and in 25% of the hospitals participating doctors and nurses had failed to inform the families in half of all cases. Strange statistics indeed. Consultation with the family is a centerpiece of the Pathway as written. There have been several calls for a parliamentary inquiry. Statism is a way of life where bureaucracy takes over the simplest and most complex of decision making processes. In an article only the day before, the Telegraph reported on the case before the High Court of accident victims being placed on “do not resuscitate” orders without their families consent. There has been a litany of similar cases in the UK press of late. “Doctors are told to pick out such patients during routine consultations that show ‘indicators of frailty and deterioration’ and are told that ‘older people are a priority to consider”. They are also told to use feedback from district nurses or hospital consultants, while patients in care homes should be “actively considered for your register”, the advice states. So it is up to you. The brother of Rahm Emmanuel, Dr. Ezekiel Emmanuel, has argued eloquently for patient rights and against euthanasia. The Liverpool Care Pathway recognizes that same human dignity, but is failing in its application. When the sorts of abuses and potential abuses reported in the UK press are considered, we must once again reconsider state sponsored medicine.